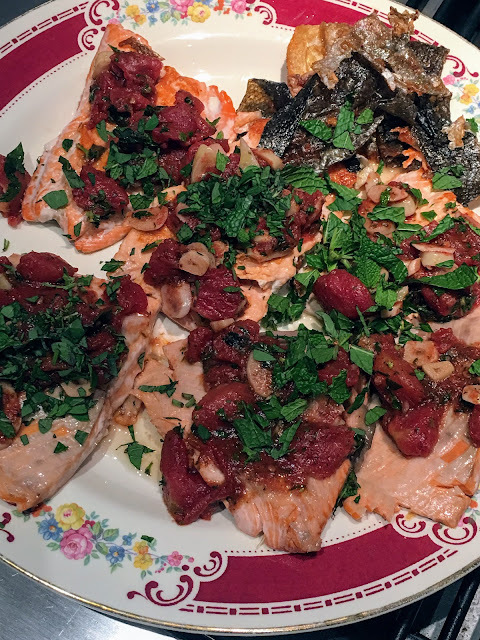 Fresh, wild Sockeye Salmon Fillets, grilled on the stovetop and topped with organic diced tomatoes and fresh herbs from my garden, above and below. 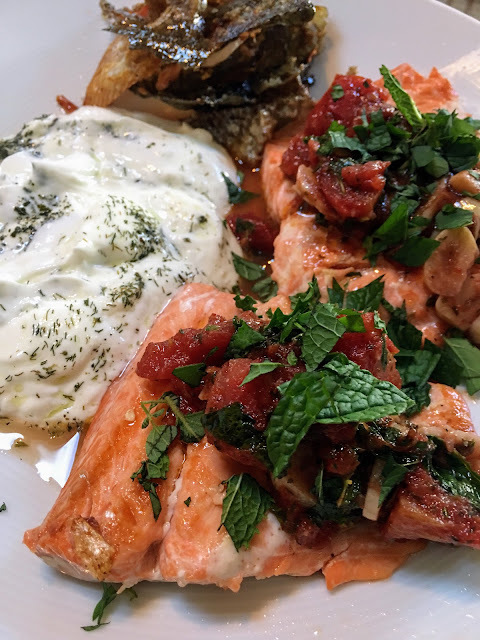 HACKENSACK, N.J. -- Tonight, I'm planning to make a big dinner of fresh, wild Sockeye Salmon grilled with ripe peaches and topped with pesto and garden herbs. My wife just called from Costco Wholesale in Teterboro, where the skin-on fillets are $14.99 a pound -- $2 less than when the first-of-the season sockeye appeared on June 16. I grill serving portions of the wild salmon on a stovetop grill, skin side down for about 4 minutes, then flipping them for an additional 3 to 4 minutes for medium. On my wife's last visit to Costco six days ago, there was very little fresh sockeye to choose from -- only two trays, each weighing more than 2 pounds, and I asked her to buy another wild fish instead. On Tuesday, I saw fresh, wild sockeye at Whole Foods Market in Paramus for about $29 a pound. Meanwhile, I received and cashed my 2% reward certificate from Costco on renewal of my Executive Membership, which now cost $120 a year. The certificate was for $192.56, covering purchases in the Teterboro warehouse and the Costco Business Center in Hackensack. That was in addition to the $365 in cash rebates I received in February by using Costco's no-fee Visa credit card to buy gasoline (4% back), restaurant meals (3% back) and travel, plus food and other items at Costco. Shrink-wrapped trays of fresh, wild Sockeye Salmon Fillets showed up at the Costco Wholesale in the Teterboro Landing Shopping Center off of Route 46 for the first time this year on June 16. Costco's Seafood Road Show also was visiting the Teterboro warehouse on June 16, a Saturday. Wild Cooked Red King Crab Legs and Claws ($22.99 a pound), above, and Wild Cold-Water Lobster Tails ($21.99 a pound) were among the frozen seafood available. On June 17, Father's Day, I used the one Red King Crab Leg and one Claw I bought to make a salad with chopped sweet pepper, onion and celery, dressed with Dijon mustard, fresh lime juice and cumin, and added fresh mint and other herbs from my garden. I also made a dressing for the Cold-Water Lobster Tail from herbs combined with more Dijon mustard, fresh lemon juice, extra-virgin olive oil, bread crumbs and sesame seeds. The tail weighed 1.29 pounds, as much as a small lobster. I removed the meat from the shell and baked the tail in the oven at 350 degrees for about 30 minutes until it was cooked through but tender. The tail served 3 with Red King Crab Salad and other food. My wife returned to the Teterboro Costco on June 20, but found only two trays of Fresh, Wild Sockeye Salmon, both with more than 2 pounds of fish. So, I asked her to buy Fresh Wild Haddock from Iceland ($8.99 a pound), which I baked in a preheated 400-degree oven for 15 minutes with Organic Spinach, Campari Tomatoes, pitted black olives, leftover herb dressing from the lobster tail, grated cheese, fresh lemon juice and extra-virgin olive oil.